What in the world is a strandbeest? It is an animal created by Dutch physicist, artisit, and kinetic sculptor Theo Jansen. While it may not be a living form in the strictest sense, the strandbeest might very well fool you. Jansen has gotten a lot of attention by creating beach animals which are self-propelling. That succinct description may not pique your curiosity enough, but trust me, watching a strandbeest in action definitely will. 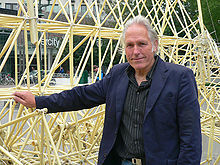 Jansen created his strandbeests using simple materials such as recycled water bottles, plastic tubing, rods, and rubber rings. Glancing at a beest, you wouldn’t think much of it – just another piece of installation art, probably. Once it starts moving on its own, thanks to the wind that has been “caught” in the water bottles, you probably will find your lower jaw dropping involuntarily. See it for yourself. In his web site, Theo Jansen gives some details on how he was able to make these things work. You can find concepts, theories, and math – even details on the 11 Holy Numbers. If you’re the sort who wants to figure out exactly how things work, then you ought to read what the mastermind himself has to say. In case you get converted and become a Jansen fan – which is likely to happen – you can also get his books and DVDs from the web site. Very weird how he considers himself as god and those mechanical lifeless walking things as his creations.. But still very interesting and entertaining way of harnessing wind energy.